Natasha has been a web geek since she had access to the web and a writer since she could write. She’s been working in digital communications roles for charities, government departments and commercial organisations for more than a decade, and set up Taskforce Digital in 2013. Natasha spends most of her online time on Facebook, Google Analytics, Shopify, WordPress and NetMums. This review of the 2014 Babyloss Awareness Week was originally written for the Miscarriage Association Newsletter. Babyloss Awareness Week is an annual opportunity to remember all babies lost in pregnancy, or during or shortly after birth, and also to start conversations about the impact of baby loss. So, from the 9th to 15th of October last year – on the internet, in the media and in the community – that’s what we did. Drawing on some inspirational ideas from creative agency LIDA, the M.A. staff and trustees developed a range of activities that our supporters could take part in over the week. For a week or two, the M.A. office turned into a mailing house as we shipped out 550 pink and blue Babyloss Awareness pin badges that had been ordered via our website. Just ordered mine. Glad to support such a wonderful association. Just wish people didn’t find the subject of miscarriage so taboo! Another 731 people added a virtual version of the awareness badge (known as a ‘Twibbon’) to their Facebook or Twitter profiles, while also posting an explanation of why it was there. Here at the M.A., we know that miscarriage doesn’t just affect 1 in 4 pregnancies. It affects people. 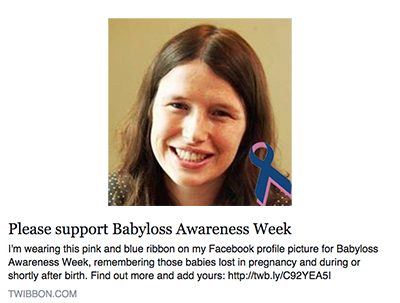 As such, we asked our supporters to upload photos of themselves holding a sign saying “I’ve been affected by babyloss” to their social media profiles. Some shared their photos with us, some more privately with their friends. As the days passed and more and more submissions came in, we created an online gallery, then a video. Through our supporters’ comments, we were made aware that, both publically and in private friendship groups, conversations about pregnancy loss were happening. Every year, on the 15th of October, the last day of Babyloss Awareness Week, people light a candle at 7pm in their local time zone in memory of babies that have been lost too soon. This creates a wave of light that spreads around the globe – and across social media. Thanks to our supporters on Facebook, our Wave of Light candle, shown here, was shared over 4,000 times and reached over 320,000 people. On Instagram, Twitter, and on Facebook page and groups, others also shared their photos and our feeds glowed with pictures of hundreds of other beautiful memorial candles. 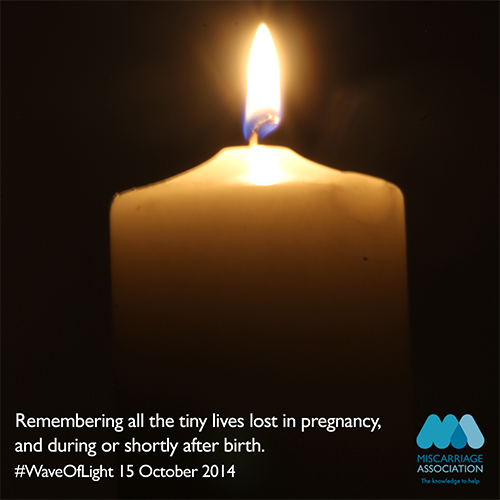 So moving to see how far ‪#‎TalkingAboutBabyLoss‬‬ has come through the ‪#‎WaveofLight‬‬ today compared to previous years and it’s not yet over as it continues to spread around the world. The support shown is truly amazing. The candles, the pin-badges, the photos and the twibbons, the media stories and the willingness of our supporters to share their experiences, all helped in starting conversations about pregnancy loss across the UK and beyond – conversations that continued long after Babyloss Awareness Week itself came to an end. Until, I swapped over to Safari to check out all the changes I had made that day. On Safari, the like box wasn’t there. I changed the URL for my Facebook page in the code from https://www.facebook.com/taskforcedigital to http://www.facebook.com/taskforcedigital. The like box still didn’t display. Finally, after a bit of Googling and reading through comments on forums and blogs, I worked out why. 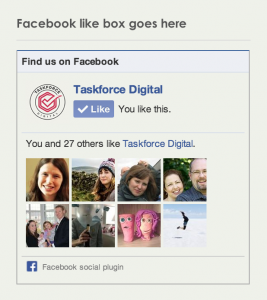 The fact that the client’s like box had disappeared was nothing to do with my code, but rather how they had changed the settings for their Facebook page. As I’m not an administrator of their page, I’ve replicated the issue with the Taskforce Digital Facebook page below. What had happened was that, when I set up the Facebook like box and tested it on the page, I was logged into Facebook in another tab of Chrome (this is not unusual). The Facebook like box appeared on the page as it should. However, when I tested it on Safari, I wasn’t logged into Facebook on that browser – and that’s what made the difference. Eventually I worked out that this was because of settings for the page on Facebook. In the Facebook page Admin Panel, you can click on ‘Edit page’ then ‘Edit settings’. Halfway down, you’ll see ‘Country restrictions’ and ‘Age restrictions’. In setting up the Taskforce Digital like box today, I tried setting these restrictions one at a time. Restricting to people aged 17 and up. It seems that the Facebook like box is accesses these settings and comparing them with your Facebook account settings. When I was logged on, I could see the like box (on any browser I tried). However, when I wasn’t logged into Facebook, Facebook didn’t know that I was over 17 and the box didn’t appear. It wasn’t even using my IP address to guess that I was from the UK. It just wasn’t showing the box. Remove the restrictions on Facebook, the box on my website reappears – even when I’m not logged into Facebook. Anyway, hope this helps someone else out there. Perhaps it may even save you some time in trying to find a coding solution for the issue. 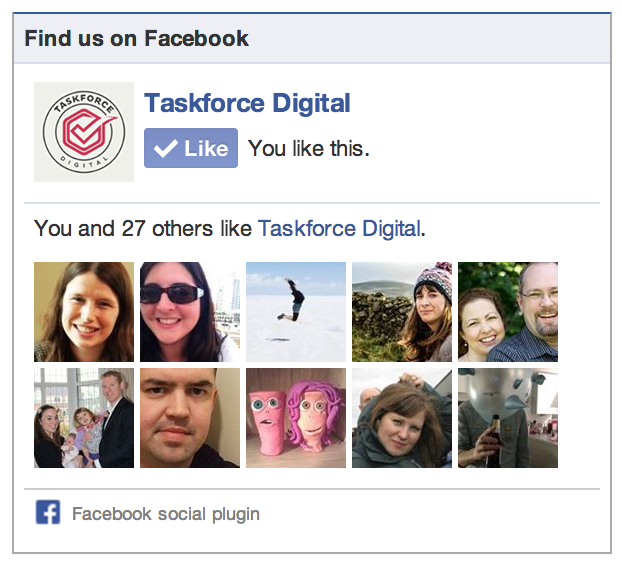 I’ve taken the Facebook like box off our sidebar for now, but if you do want to like Taskforce Digital, you can do so on our Facebook page. I’m writing this blog entry on the 27th of December from the upper floor of a stone cottage, looking out over the fields and hills of North Devon. On arrival, we were teased by a sticker on the kitchen wall with a wifi code, but so far this combination of letters and numbers has not enabled any sort of viable connection to the internet. Yesterday, in Dartmoor, I couldn’t even log into FourSquare to say I was there. Husband and child in Dartmoor on Boxing Day. Spectacular views but no internet access. While I know that this entry can be synced via Evernote later and posted to the blog later still, I’m used to an immediate, fast internet connection these days. As such, the times without it – the hours travelling north on the train, the week my husband and daughter had to connect at Australian internet cafes, this Christmas without Skype – seem somehow unnatural. It’s hard to remember that, in the grand scheme of things, even the web is new. For now though, the sun is unexpectedly shining, the child is unexpectedly sleeping, and I’m sitting atop a very high four poster bed thinking about all that’s to come in 2014. We’ve got the launch of two websites on Taskforce Digital’s schedule for January already: one in WordPress, one in Shopify. I’ve quickly set up this blog using Woothemes’ Canvas, which seems to be fairly flexible in getting the basics of the site layout done. Now I’m looking forward to trying out the portfolio and testimonials modules, and to using the Woothemes framework for a new client site. Perhaps later in the year, I’ll look into Woocommerce as an e-commerce platform as well, but for now, I’m happy on Shopify. I’m keen to try out some of their recently released features, such as gift vouchers, early in 2014. I’ve spent less time on Facebook in 2013 than I have in previous years, and that’s probably a trend that will continue. I think it’s still a useful platform for those sort of brands that people love – charities that they care about, products that they enjoy using – but for many other companies every change in Facebook’s algorithm makes it harder and harder to have stories seen without paying for the privilege through advertising and sponsored stories. Facebook competitions remain a good way to build up an opted-in email list – but in my experience this year, the call to action works better in the subsequent emails than in a Facebook post. There’s a recent LinkedIn discussion here where a number of social marketeers have expressed their views on Facebook as a marketing tool. Using the improved Facebook Insights, we may now be able to get more data about our pages’ engagement levels than we could in 2012, but it’s still no match for the combination of AdWords and Analytics in tracking ROI on advertising spend. Features introduced this year, such as bid adjustments based on time, location and device combined with remarketing techniques, have allowed further optimisation of already well-performing campaigns. The addition of the ability to cut and paste keywords, ads and adgroups, not just in AdWords editor but also in the online interface, has definitely cut down on my administration time. 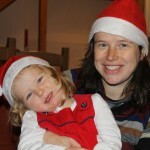 Cutting down on administration time will definitely be a theme for me in 2014, with a new baby due to make an appearance in January. I’ve recently swapped the Taskforce accounts to Quickbooks Online (from the software version), and I’m enjoying the dashboard which gives an overview of what’s earned and owed, and the ability to send invoices with the click of a button. After years of resisting, I’ve also made the move to using a Mac laptop. It’s nice to not have to blow into the air vents to get my business computer started, and the syncing between the laptop, iPad and phone is useful too (though I did manage to delete most of the phone numbers in my phone contacts in the process of doing so). I think mobile internet’s time has well and truly arrived, and while I’m on maternity leave, the plan is to spend some more time looking into responsive web design and app development. These days I have some clients who get more web traffic from mobile phones than PCs, particularly when the content being accessed deals with health or other sensitive topics. This audience deserves some focused attention too. Apart from that, I foresee the early months of Taskforce Digital’s 2014 being about MailChimp and Survey Monkey, Salesforce and, as always, the creation of great content. Beyond that, who knows? I’m looking forward to seeing those tweets that link to articles that tell me about things that I’ve never heard of before, I’m looking forward to new videos on Treehouse, new app discoveries, working with new and existing clients on whatever their online challenges will be. I’m excited about building the Taskforce team and increasing the range of skills we can offer. I’d love to read your reflections on 2013 and predictions for 2014 in the comments below. Outside the window, there are white fluffy clouds and white fluffy sheep on green hills; no sign of December snow. The star’s starting to fall off our Christmas tree. I’ve almost eaten all the mince pies. The year is coming to a close, and we’ll soon be heading back to London. I hope you’ve all had a wonderful festive season, and wish you all the best through whatever this new year brings. Hello. 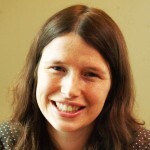 This is Natasha Judd, blogging for Taskforce Digital for the first time. It’s a first time that has been a long time coming. Back at the start of this year, after two years of freelancing by myself, I was again wanting to be part of something bigger, something that could do more, achieve more, make more of a difference than I could alone. 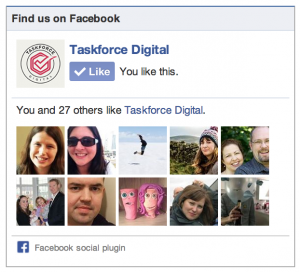 And so sparked an idea: Taskforce Digital. Not an agency. Not an employer. That may come, but not yet. Instead, Taskforce Digital is, for now, a collection of talented freelancers, who come together to work on digital projects for a range of commercial and charity clients. These freelancers are people I’ve worked with at various jobs over the last ten years, people I’ve worked with for more recent projects, people I trust. People who can work alongside me and alongside clients, and become part of an on-call team. Right now, the Taskforce Digital team spend a lot of time on Shopify e-commerce stores, Google AdWords and Analytics, WordPress blogs and social media content plans. We’re running client feedback surveys and administering Saleforce CRMs. I imagine this will change. The web is changing, technology is changing. I’m using a picture of an ethernet cable with this entry, but connecting wirelessly to the Internet via my new laptop which doesn’t even have a DVD drive. This site will change too, with time. I’ll add in more about what we do and who we work with. This might be a project for early 2014, when I’m on maternity leave with our second child. For now, there’s work to be done, sites to be finished, emails to be answered, and Christmas mince pies to bake before the end of the year. For now, writing this first blog entry is an achievement in itself, and thanks must go to those who’ve helped out over the past twelve months and more. To Jo Lambert for her support from the start, to Joe White who created the logo and brand, to Philip Cuff and the team from Think Creative for their advice, to Clare Foster for her input into projects old and new, and to my husband Matt. I’m hoping many more blogs will follow this, and that the Taskforce Digital website will become a space for the team to share their opinions on what’s going on online. The usual disclaimer applies: blog entries are the opinion of the individual concerned and not necessarily of Taskforce Digital or of any of the other members. Blog entries are merely starting points for comment and debate. The web’s good for that sort of thing. The web’s good for a lot of things and here at Taskforce Digital, we’re good at getting stuff done on the web. I’m looking forward to seeing how this develops. Congratulations to local team AFC Wimbledon! After a tense penalty shoot-out, you’ve been promoted to the Football League. You’ve caused great excitement in this living room and far beyond that. 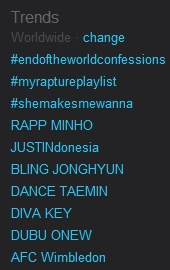 In fact, right now, you’re trending on Twitter worldwide. Thousands of people are talking about you. Oh, and your website has crashed. My husband was checking it out just after the game, and got the following error message. We then went looking for the AFC Wimbledon Twitter account. There’s @AFCWimbledon but that hasn’t been updated since November 8. There’s also the much more active @WimbledonAFC, which is run by a fan and a member of the Trust*. There’s an AFC Wimbledon page on Facebook, but the default view is the events tab – where you get a message saying ‘You have no upcoming events’. Of course, some people will know enough about Facebook to click through to wall tab and leave a message for this fantastic team. A lot of people will continue to talk about the victory even if there’s no updates from an official voice. Some may even come back to the website later and see if it’s back up and running. But to some extent, the ability to fully capitalise on the moment of victory may already have been lost. I think there’s a lesson in there for all organisations. Are you ready for your big moment? Will your website cop with the sudden influx of traffic? Are your e-commerce systems in place? Will you be joining in the discussion? Will you be able to take advantage of your seconds in the spotlight, and use your new following to take your organisation to the next level? * Update: We’ve just found @AFCWNews, which is the official Twitter page. Unfortunately it’s currently got a lot less followers than the other two. From the old blog and also iPhoneCafe.com. You can do such a lot with an iPhone. You can manage your finances, learn how to bake a cupcake, buy and sell on eBay, or whittle away the hours playing Angry Birds. And now, with Orange Mobile’s new application, Do Some Good, you can also use your phone to engage in micro-volunteering activities to benefit your community. There’s no financial commitment or charitable donations involved here; even the app itself is free. You also don’t need to commit a lot of time. Most of the activities are designed to be done in four minutes or less, requiring you to add information to a database, fill in a feedback survey, add locations to a map, or complete a range of other short tasks using your mobile phone. Over the past couple of weeks, for example, I’ve used the application to answer a wellbeing survey to help shape the services offered by Samaritans. I’ve added our neighbourhood parks to the Outdoor Play Map, and I’ve taken photos and donated them to an image bank of pictures that charities can use free-of-charge in their awareness-raising materials. If the warm fuzzy feeling of doing good by doing these small tasks isn’t enough for you, the application also allows you to work towards virtual badges and eventually real music rewards through the Orange Rockcorps collective. Like many others before it, this application is let down by the strength of my mobile internet connection. O2’s poor signal definitely makes it more difficult for me to add to maps or submit photos when I’m out and about. 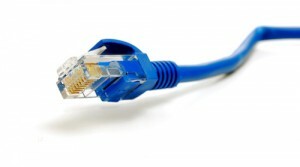 However, at home, on a wireless connection, the application is much easier to use. I was also hoping that new opportunities would be added regularly – but over the past three weeks at least, the potential actions have remained the same. There’s room for improvement in both speed and content, then. 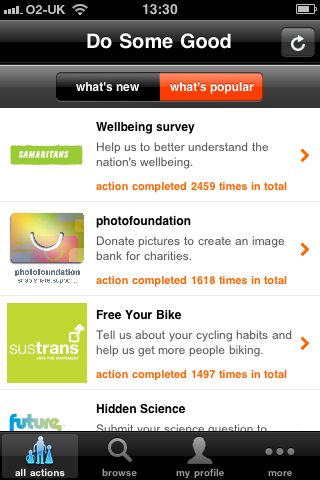 But, as I’m writing this on May 11, the users of this application have spent a total of 24 days and 20 hours completing 8952 actions to benefit charities and not-for-profits in the UK. And I think that’s a pretty good use for the iPhone. First published on iPhoneAppCafe.com. Happy to answer comments here or there. Are you writing the blog entries that people are looking for? Blog entries are a great way to bring people to your website. They provide fresh content related to your organisation or business – the type of fresh content that search engines love. Other bloggers are also more likely to link to your blog posts than the home page (or services page) of your website, and those links can bring both referred traffic and a higher ranking on search engines. So, how do you create the sort of content that people are looking for and linking to? Google keyword tool and Google trends can give you an indication of how popular particular keywords related to your industry are – and how this popularity has changed over time. Writing articles which feature these popular terms on is one way to optimise your website for searches relating to your specific niche. However, this form of keyword-based SEO is not the be-all and end-all of website content. It’s important to also tap into what people in your industry are interested in right now. Listen in to conversations using Twitter search, look at the questions that people are asking in LinkedIn Answers. Has something in your field changed in the last week? In the social media space, for example, Facebook has recently altered its promotion guidelines again. When I was searching for more information about these changes last night, it was the early bloggers who got my clicks and a link back to their posts. Alternatively, is something big going to happen in the near future? Is there an event coming up which you can link in to your topic? Last month, I wrote a couple of blog posts themed around the Royal Wedding: one on iPhone applications and another around social media use. The social media post is now the second most visited article on my blog (behind an earlier article I wrote on Facebook competitions). The final thing to remember is that on the internet, you’re rarely a minority of one. If you’re searching for information and can’t find it, then chances are that other people will be looking for that information unsuccessfully too. Can you write a blog post to fill the gap? My post on re-importing photos in Windows 7 came from such a search. While it’s never going to be my main source of traffic, it’s been responsible for one or two new visits to my site every day since I wrote it. Again, I’ve written a post here which focuses on content. So be it. In my opinion, content is absolutely key. Writing posts that are topical and useful is beneficial for both audience engagement and search engine result. That said, there are specific keyword strategies and technical tips, including search-friendly URLs, title tags and internal linking, which can also help your blog be found by searchers. You can find some of these in this article by Rowan Pawale. If you’ve got other tips for bloggers, please feel free to leave a comment below. Today, May 14, 2011, is this year’s World Fair Trade Day. The day is an initiative of the World Fair Trade Organisation whose mission is to enable producers to improve their livelihoods and communities through fair trade. And here’s a recent post of mine demonstrating a #FairTweet. When I only tried a longer message with only six characters left over, it just added the #FT hashtag. This could’ve easily been a promotion campaign for Ben & Jerry’s – but their positive PR is coming from stories about the application, such as this one on Mashable, rather than the tweets themselves. It could’ve also been used as a fundraising exercise, with every tweet linking through to a single donation page. But instead, those shortened URLs point to a range of different Fair Trade websites and articles: Fair Trade USA, Catholic Relief Services, the Fair Trade Resource Network, and so on. For me, this makes it more interesting. I want to see what the different-length messages say. I want to see where each of the links will take me. And I’m learning a whole lot more about fair trade in the process. To tweet your own message, visit www.fairtweets.com. Happy World Fair Trade Day everyone! For Mother’s Day this year, I bought myself the new Hummingbird Bakery recipe book, Cake Days. In the week that followed, I spent whole afternoons drooling over the gorgeous glossy photographs of cakes and cookies, muffins and slices, found within its pages. On April 16, however, I learned that Hummingbird Bakery had also released Cake Days as an application. Given that I already had spent £10 for the book, could I really justify also paying £4.99 for an iPhone version that contained a smaller selection of the same recipes? In the end, I told myself that it would be useful to have both ‘for research purposes’. People often say that the film’s not as good as the book – but in 2011, is the book as good as the app? 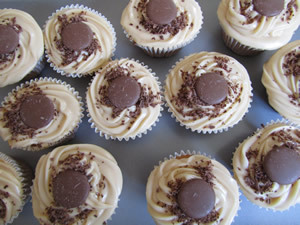 The great book vs app comparison began in the lead-up to the long weekend, when I turned to page 158 of the recipe book and decided that those lovely-looking Banoffee Cupcakes with their dulche de leche custard topping would make a great Easter treat. They were. 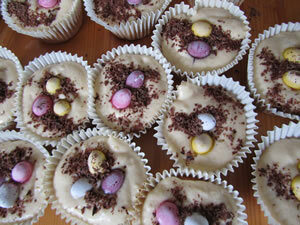 But they were also harder to make than I expected, with multiple cooking and cooling steps for the custard. Later, when I looked up the same recipe on my phone, it said Skill: Intermediate. That difficulty level wasn’t included in the printed cookbook. You can’t record your star ratings for each recipe in a printed cookbook either (without writing on the pages at least). I’m not a tidy baker, and sometime between measuring the flour and getting the cakes into the oven, I managed to splash the Banoffee Cupcake page with excess milk. Cookbook damage is always a potential side effect in any of my kitchen efforts, so when it came to baking the Caramel Cupcakes (rated easy) the following weekend using the Cake Days app, I was grateful for my iPhone’s hardened case and wipe-clean screen. I was also keen to try out the feature that allows you to clap your hands to move the recipe on to the next stage. In theory this is great, allowing you to work through the instructions without getting your sticky fingers on the technology. However, in practice, it wasn’t so effective. Every time I shut a drawer or cupboard, it triggered a new step. I had to keep swiping back to the ingredients list at the start anyway, to work out just how much milk or caramel I was supposed to be adding. The book definitely wins here by displaying the ingredients and instructions on one page. Where the app comes into its own is with the extras it offers. These include the ability to save the ingredients for your planned sugary treats to a shopping list. I would’ve liked to be able to add just the ingredients that weren’t in my cupboard and to be able to send the list to myself via email – but having this on my phone is still better than carrying around a photocopied page. Another highlight of the app is the video content. There’s a section at the end of the book, for example, which gives written instructions on how to perfect Hummingbird’s signature swirled frosting along with step-by-step photos. However, the short video demonstration on the app makes the whole process seem much more achievable. I also discovered, after baking my Caramel Cupcakes, that there was also a video on the app showing how the professionals make them. The Cake Days cookbook, with its bright pink cover, looks very pretty on my shelf. For now – at least when I want to try out one of the 85 recipes that are also in the app version – I’d say it’ll stay on my shelf. While there are still some flaws in its usability, and extra features that could be added, the Cake Days iPhone app does, I feel, outperform the book. On the iPad, with its bigger screen, I’d imagine that the application works even better. 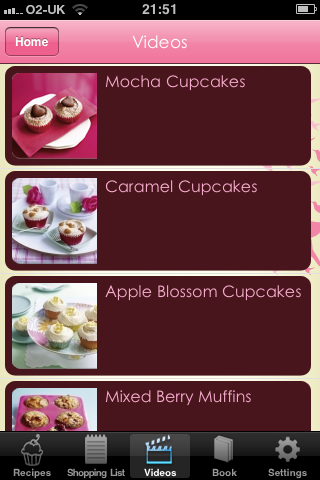 Of course, in both the book and app baking experiments, the final cupcakes were delicious. And there are some that would say that’s the most important thing. First published on iPhoneAppCafe.com. Happy to respond to comments here or there.